This morning, I dropped off the car at Downtown Toyota and decided to walk the rest of the way to work. That was actually a good work out (by my low standards). If I walked directly from home, it would be another 15 minutes and 0.8 miles for a total of 3.5 miles and 68 minutes by Google Maps standards (it was actually pretty accurate for today's walk time). I'm definitely feeling the pains of being overweight and old. 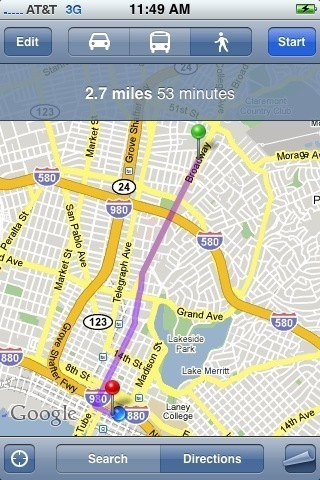 I think I'll incorporate this walk a couple of times into my week's sparse exercise schedule. One thing I'll definitely NOT do is lug my backpack with a laptop in it. My legs and knees are fine but my shoulders are killing me. NOTE: Before anyone gets worked up, my wife took this shot while I drove. 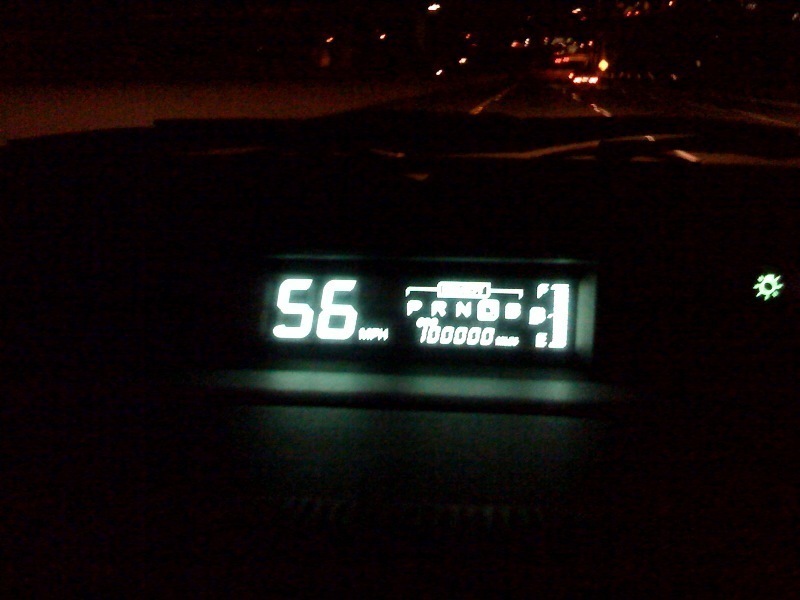 Our 2001 Prius hit 100,000 miles over the weekend. This car has done us well over the years. Averages about 45 MPG and never really had any major work done on it. Only downside is that we've swapped out our tires more frequently than usual (about every 20K-25K). But on the upside, thanks to regenerative coasting/braking, I've never had to change my brake pads and the treads are still at about 50%. So far no problems with the battery either even though it's supposed to be replaced after 100,000 miles. We'll see if anything changes in the next couple of years. Could electric cars be the new SUVs? Let's hope so. News came out last week from the Detroit Auto Show that Toyota and Ford will be looking to release pure electric vehicles (not range extending fakers like the Chevy Volt) in the near future - about 2012. It seems to be a theme at this year's show, as all other automakers were releasing some sort of hybrid version of something. The big question is whether next year's show will still have the same focus. As oil prices decline (I paid $1.89 per gallon the other day! ), there will be less pressure for consumers to buy fuel efficient cars thus less incentive for automakers to develop new technologies. Do you think a company like Tesla Motors could have been built and funded in an era where gasoline costs $1.25 per gallon? Perhaps, but it wouldn't get as much attention as it does (and deservedly so, the Tesla Roadster is amazing). When you think about it rationally, there are many reasons to want to get a fuel efficient car, the least of which should be to save money. The environment and national security should be the top reasons but often times we only see what's directly affecting our wallets. UPDATE: As a point of clarification, I don't mean to say that people shouldn't be cost conscious in these difficult times. My point is that not buying a hybrid because it may cost more initially is not a good argument. The cost of buying a hybrid versus a non-hybrid compact or mid-size car is not that great plus the savings in gas over time will minimize that gap even further. If you don't want to buy a hybrid because you need to haul kids, groceries, lumber, etc. that's fine. However, if you're waffling over whether to get a Corolla, Focus, or Jetta, buying a Prius or a Civic Hybrid isn't much of a stretch. Trust me, you'll make that money back in about 4-5 years. Auto bailout DOESN'T fail... How that's still a bad thing. I woke up this morning to the radio airing the news that the auto bailout has passed. I'm glad a lot of people won't be losing their jobs but I think we're only delaying the inevitable. The $17.4 billion bailout has provisions that require, among other things, the automakers to "prove they can restructure sufficiently" or those loans would be called back. My question is, can the automakers really turn it around? It's like a gambling addict who just needs some seed money to win back all the losses his accumulated over the years. Chances are, it's just not going to happen. And what if they don't sufficiently restructure? Would they really care if the loans are called back? They'd be in the same position they were before the bailout except now with three months of salaries paid. And actually, I don't think Congress would have the guts to actually do it. The old cry of "we can't let the US auto industry fail" will be heard again. If the government really wanted to make a difference, they should have asked for the resignation of all top level executives from any company that asked for a loan. The way it's setup now, these automakers will come back to Congress in March and either ask for more money or time to prove they are restructuring (probably both). Why would anyone give money to a group of people who have a history of failure? This is in stark contrast to a company like Toyota who hasn't had an annual corporate loss in 71 years (they expect to end the current fiscal year with a loss). In fact their profits in 2007 alone were $14.9 billion - almost the same size as the current bailout. With a cushion like that, who needs a handout?